There are many names for the Ouija Board. Devil's Message Board, Egyptian Message Board, Word Board - to mention just a few. Some people believe that Ouija Boards are ancient and go back as far as 500 BC. 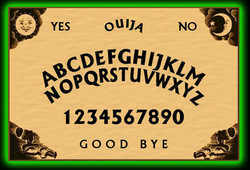 However, the Ouija board as we know it, is young compared to older methods of contacting the spirit world. Similar devices may have existed before the Ouija Board, but it is the Ouija Board that seems to have outlasted them all! So what is a Ouija Board? 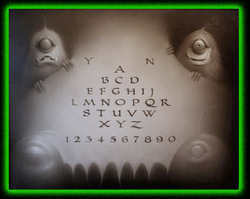 It is a flat board with the alphabet and numerals on it. The Ouija Board is used with a planchette (a small pointing device). The latter was not used with the board until a lot after the board was invented. The Victorians used to use a table and cards (or paper) with the letters of the alphabet and the numbers 0 to 9 written on them. They used a wine glass used as a pointer and the whole system was seen as a parlour game. No one seems to know just who invented the Ouija Board as we now know it, but it’s thought to be Elijah Bond, since his name is on the original patent documents. It may have been Charles Kennard, but regardless of who actually invented the Ouija Board, Kennard Novelty Company patented it on February 10, 1891. This new creation was called "Ouija". Kennard claims that he chose this name because he claims the board told him that Ouija was Egyptian for "Good Luck." Kennard's company began producing Ouija Boards (also called Egyptian Luck boards) in 1890. They sold for around $1.50 and they were made of solid wood. The boards were huge and so was the planchette. After only a year, Charles Kennard was out of the Ouija Board business. A man who worked for Kennard Novelty Company ended up taking over. He is probably the best known name in Ouija history: William Fuld. His name is on every genuine Ouija Board made for over 100 years until Parker Brothers took over in the 1990s. William Fuld along with his brother and business partner Isaac, changed the name from Kennard Novelty Company to the Ouija Novelty Company, and continued selling boards in large numbers. When Isaac was fired and set up his own shop, the company name was changed again to the William Fuld Company. William Fuld then owned all rights to the Ouija Board. He claimed that he invented the Ouija Board, too. He also said that the name Ouija was a mixture of the French and German words for "Yes", i.e. "Oui" and "Ja", hence Oui-ja. After his death in 1927, William's children took over the business and continued selling the boards through the great depression up until 1966, when they retired. This is when the Ouija board rights were credited to Parker Brothers. The first wooden boards Parker Brothers produced were well made and sturdy. Eventually, though, the boards were manufactured out of hardboard; then tightly-pressed paper and finally cardboard. In the 1960’s the Waddington Group produced the board as a child’s game, and it was sold widely in toy shops around the UK. After a lot of opposition from various religious groups it was taken of the shelves. The main reason for this opposition comes from some of the stories that children told about "the Devil" communicating with them through the board. 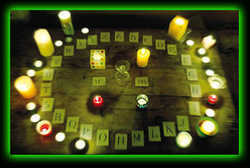 The Ouija is still one of the best selling board "games" in the world, second only to Monopoly. If you have any comments about this subject please go to the Blog and leave a comment.